You are here: Home / Green Living / Make linen bread bags in just 15 minutes – no more moldy bread! 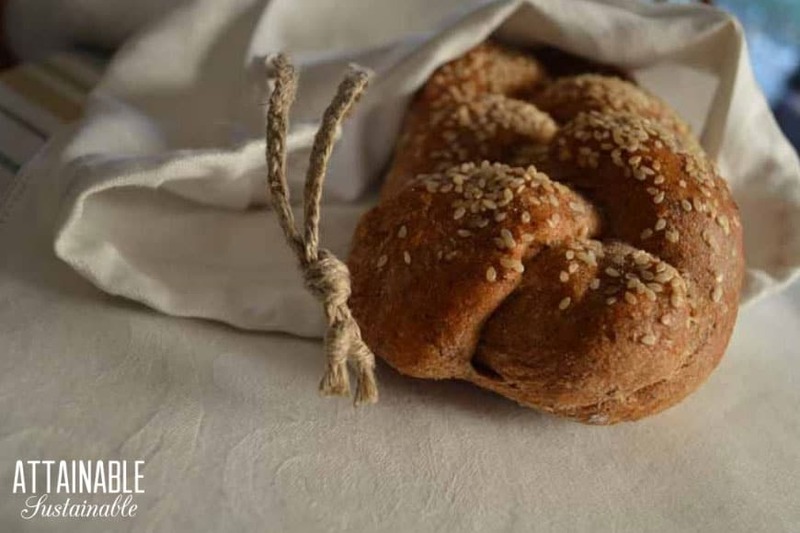 Make linen bread bags in just 15 minutes – no more moldy bread! Wondering how to keep bread fresh? Here’s how to store homemade bread in DIY linen bread bags so it lasts longer. Here’s how to make a bag from thrifted linen in 15 minutes! My family doesn’t go through bread very fast. I bake two loaves of challah each week, and inevitably more than half the second loaf is wasted due to moldy bread. Up until now we stored our bread in plastic bags. So not only is the bread wasted, but the plastic bread bags are sent to the landfill, too. Once there is mold in the bag you can’t clean it out. There’s too much plastic waste in the world already and I didn’t want to be responsible for creating more. I’ve been on a zero-waste mission this year, so I was serious about solving this problem. I had a wooden bread box, but that wasn’t a good solution. The bread box takes up too much room on the kitchen counter. After searching for a few years I think I’ve finally found the solution to my moldy bread problem. And I found it at the thrift store for less than a dollar. My local thrift stores often have 100% linen napkins for sale. Linen is the perfect fabric for storing bread. The French have known this for centuries. After all, that’s what they used to store bread in before plastic bags came along. They knew how to keep bread fresh! Want to try storing your bread in linen bread bags but just don’t have time to make them yourself? This shop on Etsy has some cute options! You can hang your bread with the drawstring so you won’t lose it under armloads of produce. 1 – 100% linen dinner napkin — square with a plain edge. Choose a heavier linen fabric over a fine linen fabric. I used a 22″ x 22″ napkin. 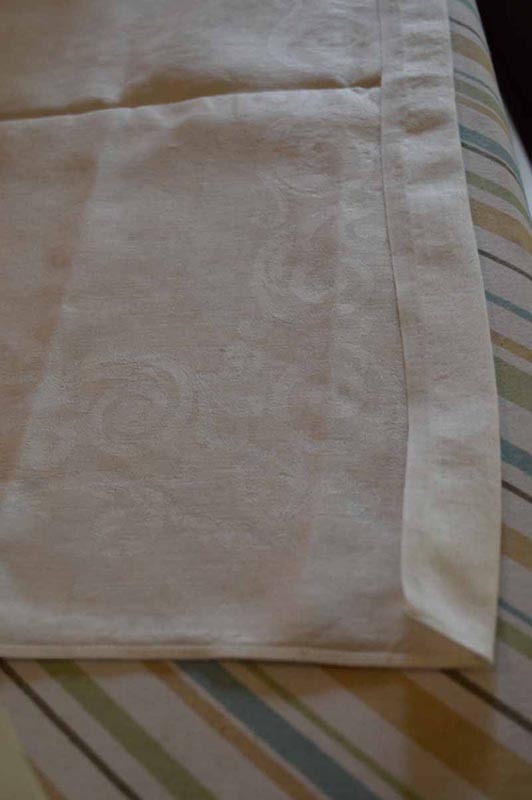 I found two beautiful, never used, double damask linen dinner napkins at the thrift store for $1.50 (for both!). These were 24″ x 24″ before washing and ironing. They shrunk down to 22″ x 22″, the perfect size for a long artisan loaf of bread. The finished bread bag will be 21 inches long and 11 inches wide – ample for baguettes, challah, and other long artisan loaves. If the finished cloth bread bag seems too roomy for smaller loaves, simply secure it closer to the loaf. Wash and iron the dinner napkin before you begin. This cleans and preshrinks the fabric and makes it easier to work with. Decide on which is the right side of your napkin. With some woven designs like double damask it may be hard to determine which side is the right side. Check which way the hem is folded. That may give you a hint. With the wrong side of the napkin facing you, fold over the top edge of the napkin toward you, three-quarters of an inch. Pin in place and press. Stitch close to the edge of the napkin, away from the fold, to make a ¾” casing for the string. Leave the ends open. Fold the napkin right sides together, with the stitched casing at the top. Pin the bottom edge and the open side edge together. Begin at the bottom corner, at the fold line. Stitch along the bottom edge allowing ¼ inch seam. Turn the work and continue stitching up the open side, stopping just before the casing. Open the napkin-bag right side out and steam press the seams. Trim any lose threads. Use a pin to pull out the corner edge to make crisp corners. Press the corners of the linen bread bag. Topstitch on the right side, ¼” from the finished edge. Begin on the folded edge, just after the casing. Top stitch around the bag, across the bottom and on the stitched side, stopping just before the casing starts. Leave the casing free of stitching. Cut a ribbon or thick piece of seine twine, or a fancy braid, 27″ long. 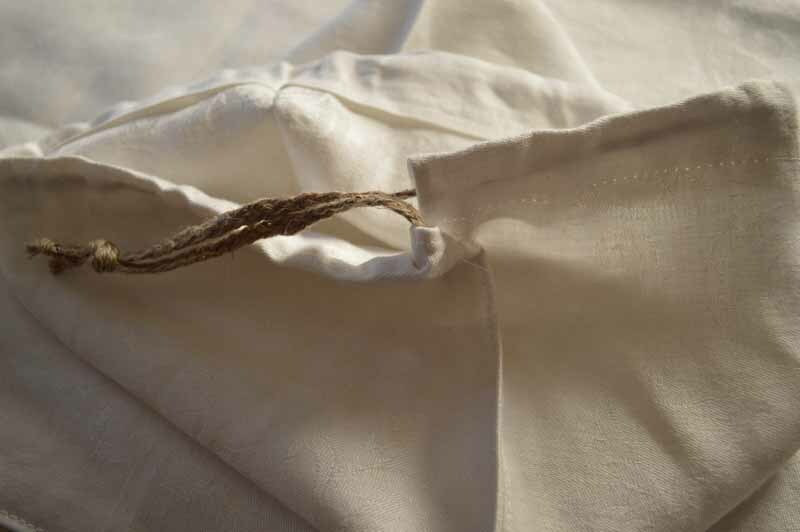 Using a large safety pin, pull the twine, braid, or ribbon through the casing at the top of the linen bag. Stop before you’ve pulled it all the way out. You’ll have two ends with the middle part inside the casing. Take the two ends of the twine and tie them with an overhand knot. Viola! Your bread bag is complete. This is a quick tutorial, but you can exercise your creativity on the finished bread bag with embroidery, stenciling, or fabric paint. Avoid beading. Beads can make the linen more difficult to iron. How can I tell if the napkin is linen? See my post on distinguishing vintage linen fabrics from cotton or synthetic fabrics. Can I use a linen tea towel instead of a napkin to make bread bags? Yes. Linen tea towels are usually of a coarser and looser weave than linen dinner napkins, and so the seams may ravel if you need to cut them to make the bag fit. Try to avoid cutting the fabric. The average pure linen tea towel is 17″ wide by 27″ long – long enough for a classic French Baguette, without cutting. Using this method, the finished baguette bag will be 8″ wide and 25″ long. How long will my linen bags keep homemade bread fresh? About two days for that fresh baked texture, depending on the humidity and temperature of your house. Another three to four days, as it begins to get progressively drier on the ends. If you need to keep your fresh bread longer than five days, I suggest freezing it. Once you bring it out of the freezer, unwrap it to keep it from getting soggy and place it in the linen bag to thaw. You’ll still need to use plastic, foil, or wax paper to wrap the bread before you put it in the freezer. I get my bread from the bakery in paper sacks. Can I put the paper sack in the linen bread bags? Yes, that’s a good way to keep the linen bread bag cleaner and to keep your store bread to keep it fresher just a little longer. The paper lets the bread breathe, while slowing the moisture loss. How do I take care of the linen bread bag after use? Wash it with your whites. Hang your linen bread bags out to dry or put in the dryer. Take it out while it’s still a bit damp and iron it with a steam iron. The linen will shine after ironing. If the linen gets too dry to iron easily, use this lavender linen spray to make ironing linen easier. The essential oil scent is brief and won’t affect the flavor of your bread. Would I be able to use 100% unbleached muslin instead of a linen napkin? 100% muslim is cotton and cotton doesn’t have the same antibacterial, moisture absorbing capacity as linen. Linen is the idea fiber for bread bags. With cotton, while you can make a bag, it won’t prevent the bread from drying out in the same way that linen does. It will probably work though for storing bread for 48 hours. So if you go through bread quickly it might be fine in your situation. I am also a re-user, re-cycler. re-purpose person. I try to prevent waste. Thank you for this tutorial I appreciate it and you. Oh, this made me just think that a couple of bags like this with a sourdough starter would be a GREAT gift! I think that’s a great gift idea, too, with a hand written recipe, a jar of sourdough starter, and a loaf of sourdough bread. This is genius! Thanks for this post. 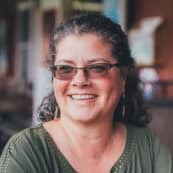 I have been sewing and baking for most of my life and never thought there would be a difference between cotton and linen. It feels wrong to make a super healthy loaf of bread and then drop it in a plastic bag. I wash them out once or twice if they don’t have meat in them, and i save some old ones to store craft supplies in, but most end up in the landfill. Thanks! PS…most people in my family bake, so this will be a great Christmas present if I start now! Thank you so much. I enjoyed your article about the Linen Bread Bags. I would really like if you made the article Printable. I like to save articles for future reference. Thank you. Copy and past it into a word or word pad doc and save it. Love this idea! Thank you for an excellent tutorial. I will watch for organic linen so I can make these bags. We eat only home baked bread these days. Like you, we can’t eat it before it begins to dry out. Thankfully, we haven’t had a mold problem, probably because I bake wild yeast sourdough bread, and it doesn’t mold as quickly, but it does get dry. I did not know linen is antimicrobial. Does it keep that quality after whatever processing the fabric manufacturer has done and many washings? You’ve talked about homemade or freshly bought – will these bags work for regular bought bagged sandwich bread, rolls? I don’t see why not, but maybe Chris will chime in, too! I had no idea about linen bread bags! Thank you so much. However, this is almost the exact procedure for making gift bags from fabric remnants. I’ve made all the Christmas gift-wrapping bags we’ll ever need, including extras to rotate with family we mail gifts to, and I had the whole process down to 5 minutes per bag. (it takes me longer than that to wrap a package in paper). I`m sure a lot of people will benefit from your clear and concise instructions. It is just a basic draw string bag. But don’t use regular cotton fabric for this. You won’t be happy with the results. Linen absorbs moisture from the air and that’s what keeps the bread fresher longer. Enjoyed your post here about linen bread bags and will likely make some! Thank you. 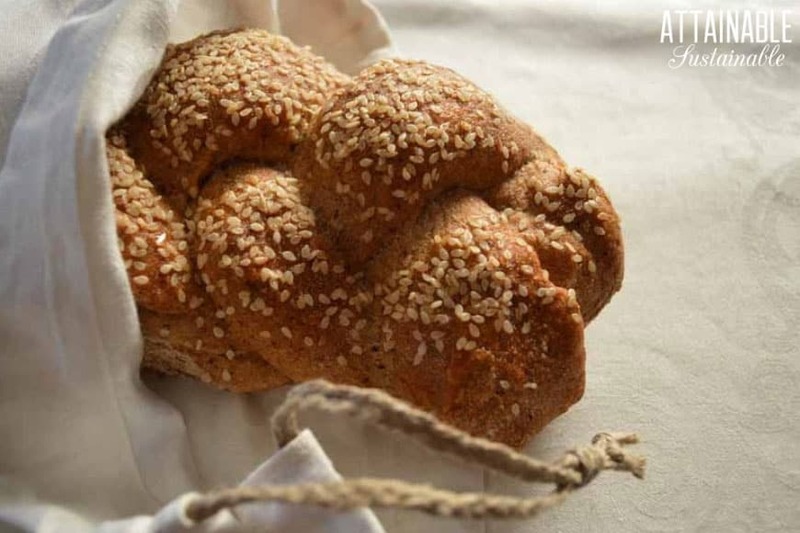 Since you make challah so often, I’m betting you have a killer recipe – and is that recipe one that you’ll share? I’ve tried several different recipes, but have yet to find one that suits me as a go-to. Thanks for this as well. The link to Chris’s challah bread recipe is in the first sentence, dark black. Maybe black isn’t obvious enough! The idea is to store without the plastic bag. 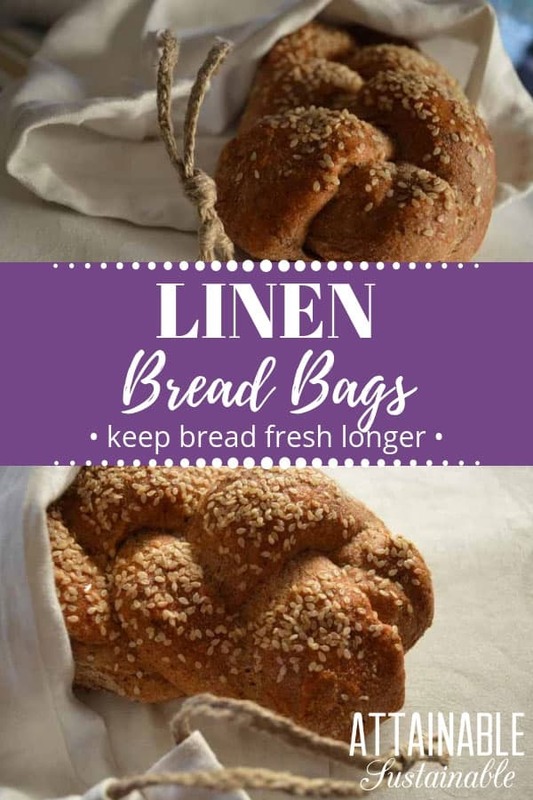 Hello, I have been using plastic bread bags to store my homemade bread and was so excited to find out about linen bread bags. However, upon my first use of linen, my loaf of bread became hard and stale in just two or three days. Within a couple more days the only part that was soft was a small inner section. Can anyone tell me what I am doing wrong? I want to reduce the use of plastic in my kitchen but the bread was actually keeping longer for me in plastic as long as I would set it in the fridge. That is interesting. I have also wanted to try cloth/linen bags but was skeptical how this could be. Perhaps it has to do with the humidity of the area you live in? Julie, you may live where the humidity is too low. My area has medium humidity — not desert, but not “humid”, and my loaf lasts 3 or 4 days. It is very dry in a week if I leave it in the bag. You may want to try the beeswax wraps for your bread rather than the linen bag. 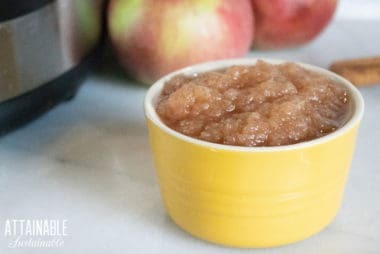 https://www.attainable-sustainable.net/zero-waste-kitchen/ These work better in low humidity areas. Would you be interested in making me 30 of these bread bags for my bread shop that I am opening soon? I don’t sew but I love the idea! Neutral colors are fine. If so, email me and we can discuss price. I bet you can find someone right in your community who could make these for you. It’s not something I can take on! 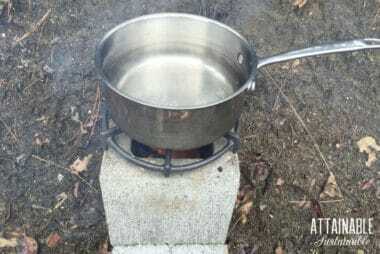 Great solution for an old problem. The typical measurements really help. Thanks, I just subscribed for more wisdom!!! hi. so i just purchased a few linen bags and i am scared if i leave the bread in the bag out in the open i am going to allow the air to dry it out? should i put it in the fridge? or will it be fine out for a few days in just the bag? I made a bag just yesterday – directions are super easy to follow and very well written – pictures are good too. I put a fresh loaf of bread in the bag right after the bag came of the sewing machine. This morning my bread was hard which made it difficult to slice so I’ll have to continue to look for other reusable options. On the upside I now have great bag for produce or bulk bin. I may make more for the upcoming farmers market season to go along with my crocheted bags. These sound like a cottage industry for the women here in Bulgaria to help them get out of poverty. I’m not sure how readily available linen is, but this is a great idea. Thank you for sharing! The directions are easy to follow. Wouldn’t that be something?? I have people ask all the time where they can buy them — if something comes of this, please let me know. Loved this post. I wish I had a sewing machine at home, but I think I will attempt to make this by hand. Shouldn’t be too difficult, but it might look like trash. I guess as long as it’s fulfilling its purpose, it should still be alright. Now to find some linens at a thrift store!!! I made this as part of my Christmas gifts this year! 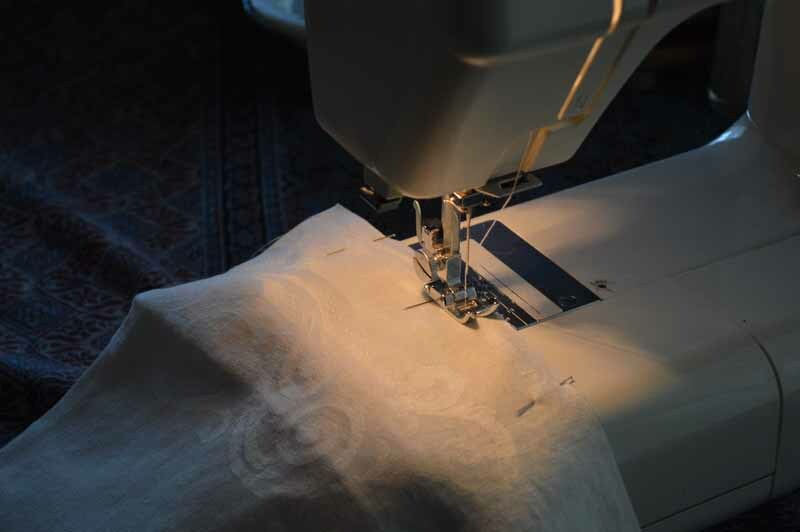 Great project for a novice on the sewing machine. Can’t wait to buy my first plastic-free loaf of bread!